Though paper wasps are beneficial insects, they tend to nest in close proximity to people, putting us at risk for stings. In some cases, it may be necessary to control paper wasps to minimize such risk. Paper wasps construct the familiar, open-celled paper nests we often see suspended from eaves or porch ceilings. Most paper wasps in North America belong to the genus Polistes. Although their tendency to sting in defense of their nests can be of concern, these wasps do serve an important ecological purpose as predators of other insects. They collect caterpillars, beetle larvae, and other insect prey to feed their young. Don't be too quick to get rid of a paper wasp colony if it isn't causing a problem. Each year, the paper wasp queen must build a new nest, which she does by masticating wood fibers into a pliable pulp. After she raises her first generation of eggs, these offspring will assume the role of construction workers, expanding the nest to meet the needs of the growing colony. By summer, the paper wasp nest can be quite large, reaching a width of 6–8 inches. In fall, freezing temperatures will kill all but the queen, who seeks shelter and hibernates for the winter. The nest degrades over winter and is rarely reused the next year. As with any insect, it's important to identify it before determining how and when control is necessary. Be sure you know the differences between wasps, yellowjackets, and hornets before taking action. Paper wasps can and will sting in defense of their nest or when threatened. Unlike honeybees, which have barbed stings and can sting only once, paper wasps can sting multiple times. A paper wasp can call other colony members using alarm pheromones, chemical messages that tell other wasps to help defend the nest from a threat. Try to stay calm and avoid swatting at paper wasps. Follow some tips for avoiding being stung. Before you do anything to get rid of paper wasps around your home, ask yourself if you can tolerate their presence. Paper wasps help keep hungry caterpillars and other plant pests in check, benefiting your landscape and garden. If a paper wasp nest is located on your property but away from high-use areas, consider leaving it alone. Although they do sting, they do so only in response to a threat. Humans and paper wasps can often coexist peacefully. Obviously, when someone in your household has a wasp venom allergy, you may need to remove any nests to minimize the risk of an allergic reaction to a sting. 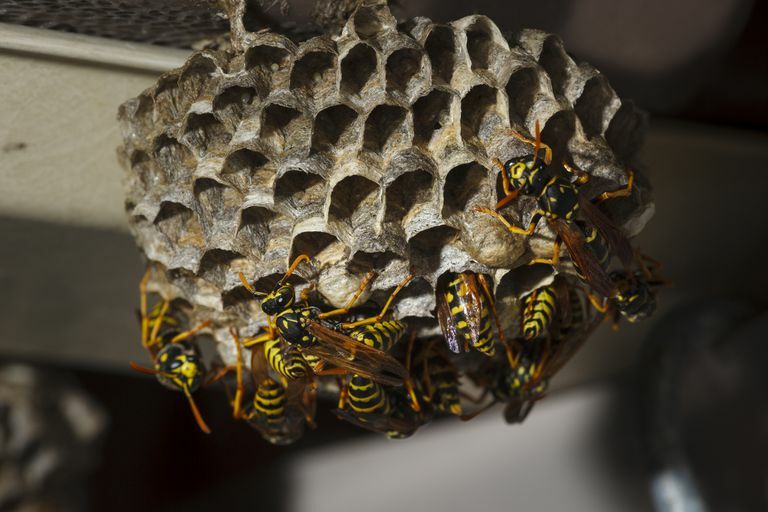 If a nest is located near an entrance to your home or by a porch or deck where you spend a lot of time, you may need to take action to control paper wasps. Check eaves, shutters, and other high-traffic areas in your yard early in the spring, when paper wasp queens are first building their nests. If you find one early in the spring, before the first generation of workers has reached adulthood, you can simply knock the nest down with a broom to discourage the queen from nesting in that location. Larger nests, or those found later in the season, should be handled cautiously. Never attempt to remove an active wasp nest during the day, when the insects are actively flying in and out of the nest. Wait until evening, when the paper wasps have settled in for the night, to treat or remove any nest. During periods of cool weather, you may be able to treat wasp nests, as the insects become lethargic when temperatures dip down to 50 F or lower. Chemical pesticides should be used as a control method of last resort for any insect pest. In this case, the safest method of eradicating paper wasps in a problem area is, indeed, with a commercial wasp spray. Look for a product labeled for use on wasps and hornets, and remember, the label is the law. You must read the label and follow all directions for using any pesticide product. Wasp sprays usually come with a propellant that allows you to spray the pesticide from a safe distance. Coat the nest in the pesticide, covering all the cells of the nest. Never stand directly below a paper wasp nest while applying the pesticide. Wasps may drop from the nest, and you also risk getting the chemical in your eyes or on your skin. Check the nest the next day for any signs of wasp activity. Before you remove a nest, you must be sure that no workers survived the pesticide application. Wasp sprays kill on contact. Wasps that were absent from the nest at the time you sprayed may return to the nest site. If you don't observe live wasps near the nest, use a broom or other long-handled tool to knock it down. Dispose of the nest by putting it in a sealed baggie and placing it in your household trash. Cranshaw, Whitney. Garden Insects of North America. North Carolina Cooperative Extension. Controlling Paper Wasps In And Around Structures. 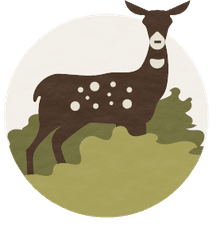 University of Minnesota Extension. Wasp and Bee Control.